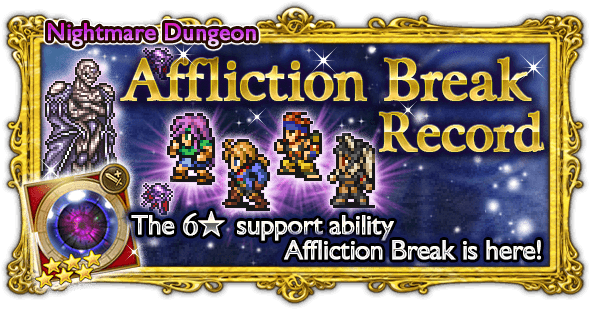 Penalty Break is a 6* Support ability. 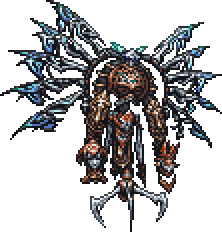 It deals 2x Physical damage and lowers the chance of targets landing a status ailment on you. Tsunami: Deal moderate water damage to all targets. Leviathan acts twice a turn. 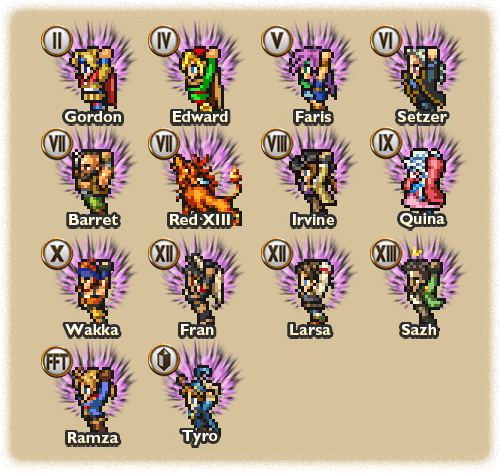 Cast Reflect on Leviathan to bounce his buffs to your party members! Defeat Rubicante without being KO’d. Inferno: Deal massive fire damage to all targets. Reduce his magic as much as you can and go full physical. If you choose to exploit his weaknesses, his Defending phase can be annoying. Afflict Jenova DEATH with Poison. Red Light: Deal fire physical damage to one target. Tropic Wind: Deal heavy fire damage to all targets. J.DEATH acts twice a turn. Highly recommend fire resist accessories. Poison is a must, it deals >4k per tick. Attack: Deal physical damage and Sap one target. Lunge: Deal physical damage to one target. Gnaw: Deal physical damage to one target. Crown: Deal heavy holy damage and Confuse one target. Sword Dance: Deal physical damage to all targets. Reduce Lower Right Barrier’s MAG. Defeat Necrophobe without him using Nightmare Hurricane. Vacuum: Deal moderate ranged physical damage to all targets. Sap: Deal moderate magic damage and Sap one target. Hurricane: Deal special magic damage to all targets, proportional to their current HP. Nightmare Death: KO all targets. 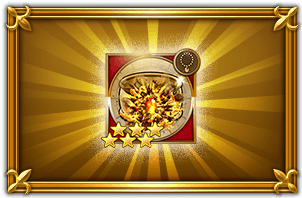 Flare: Deal special massive NE magic damage to one target. Holy: Deal special massive holy magic damage to one target. Firaga/Blizzaga/Thundaga: Deal fire/ice/lightning magic damage to all targets. Phase 1: Reduce his HP to 80% within 5 turns. Make use of this opportunity to debuff him. Phase 2: Necrophobe will summon 4 barriers. From this point on till the end, he will be immune to breaks. The barriers are invincible and has single/multi target magic. At the start of this phase, 1 barrier will use Abyss Doom. Each Abyss Doom activated will lower Necrophobe’s DEF/RES, but increase his ATK/MAG. It seems to me that he has higher stats in this phase too, as I need 3 Abyss Doom to deal the damage I was dealing in phase 1. To activate Abyss Doom, use a specific Breakdown on the corresponding barrier. Full Break and dances doesn’t work. This will trigger Abyss Doom on a random character (maybe not random?). To turn it off if it is running out, use the relevant Breakdown on the correct barrier again. Besides this just spam attacks on Necrophobe. Phase 3: Still not sure about this but it will enter this phase at 25% HP if you either take too long, or do not have at least 2 Abyss Doom activated. In this phase, the barriers are gone and Necrophobe only has 1 attack: 9999 on a single character, which can be avoided with Magic Blink. Many JP players ignore phase 2 gimmick. They play defensively in phase 2 while building up SB gauges, then DPS burst this phase. Though many have Magic Blink relics to avoid death. 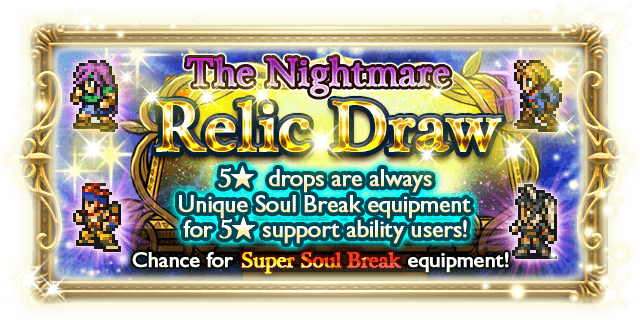 This next writeup is done by lindmejo from the ffrk subreddit! – White and black magic, as well as ninja scrolls are countered, so this is clearly meant to be a physical fight. – The fight starts off fairly straightforward, with only necro doing melee attacks and light aoe physical, sometimes flare. Pretty easy start. – At around 75%, 4 different colored barriers spawn and one will cast a 20 second death sentence. Based on the color of the glow around the death sentenced character, you must use a specific breakdown type on the corresponding colored barrier. they cannot be killed, so don’t bother targeting them if you don’t have to. If you use a high break on a barrier of the non-corresponding color, it will use death sentence abyss and necros offensive abilities will increase, while his defensive stats will decrease. If you properly remove the death sentence via the provided mechanic, the opposite effect will occur, with his defensive stats increasing and his offensive stats decreasing. Necro is IMMUNE to defensive breakdowns while the barriers are present. 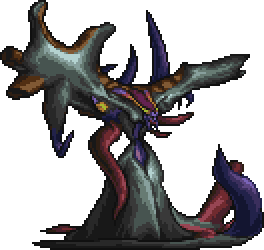 – after a set amount of time, necro will absorb the barriers and move into phase 3, where he will begin picking off characters one at a time with a 9999 damage flare abyss. You can deal with these using magic barriers (my approach), reraise sb, or some combination of the two. – another strategy is to kill him before he reaches phase 3 by intentionally provoking death sentence abyss casts to lower his defensive stats and deal more damage; however, keep in mind that his offensive stats increase as well, and the damage can get overwhelming. 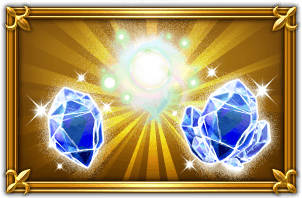 – ice, fire and lightning resist gear will help with damage mitigation since those are the only elemental spells used other (quite frequently too). Technically holy counts as well, but holy and flare are far less frequent. in phase 3, use magic blink + Interrupt, which makes the boss rather harmless!